Ben Forster will extend his run as ‘The Phantom’ until Saturday 2nd September in the smash hit Andrew Lloyd Webber musical The Phantom of the Opera. 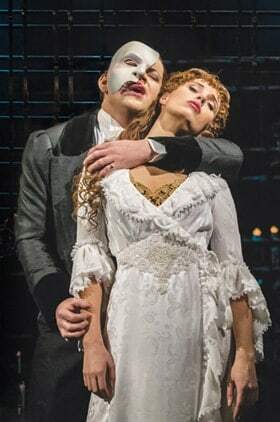 Now in its 31st year at Her Majesty’s Theatre in the West End, the show also stars Celinde Schoenmaker as ‘Christine Daae’ and Nadim Naaman as ‘Raoul’. They are joined by Siôn Lloyd as ‘Monsieur Firmin’; Mark Oxtoby as ‘Monsieur Andre’; Paul Ettore Tabone as ‘Piangi’ and Daisy Hulbert as ‘Meg’. Also continuing their roles are: Lara Martins as ‘Carlotta’ and Jacinta Mulcahy as ‘Madame Giry’ and Harriet Jones as alternate ‘Christine Daaé’. Ben Forster is probably best known for winning the ITV1 show, ‘Superstar’ – Andrew Lloyd Webber’s TV talent search for ‘Jesus’ in “Jesus Christ Superstar”. His other theatre credits include: ‘Buddy’ in “Elf The Musical” and ‘Magaldi’ in “Evita” both at the Dominion Theatre. Celinde Schoenmaker has played the role of ‘Fantine’ in “Les Misérables” at The Queen’s Theatre, having made her West End debut in 2013. Previously she played ‘Jenny’ in a production of “Love Story” which toured Holland. Nadim Naaman most recently appeared as ‘Charles Clarke’ in “Titanic” at the Princess of Wales Theatre in Toronto. His London theatre credits include ‘Anthony Hope’ in “Sweeney Todd” at Harrington’s Pie & Mash Shop; “One Man, Two Guvnors” at The National Theatre and Theatre Royal Haymarket and “The Sound of Music” at the London Palladium. Siôn Lloyd most recently appeared in “Titanic” at the Charing Cross Theatre. His other recent theatre credits include: “The Bodyguard” on tour; “The Pajama Game” at the Shaftesbury Theatre; “Avenue Q” at the Noel Coward Theatre and “The Full Monty” at the Noel Coward Theatre and UK tour. Mark Oxtoby most recently appeared in “Charlie and The Chocolate Factory” at the Theatre Royal Drury Lane. His other theatre credits include: “Joseph and the Amazing Technicolor Dreamcoat” at the Adelphi Theatre; “A Model Girl” at the Greenwich Theatre; “Brighton Rock” at the Almeida Theatre and “Oh, What a Lovely War!” at the National Theatre. Paul Ettore Tabone’s previous theatre credits include “Love Never Dies” in Melbourne, Sydney and at the Hamburg Stage Operettenhaus. In 2013 Paul was accepted as a ‘Young Artist’ in the prestigious Luciano Pavarotti Foundation of Modena; performing with Placido Domingo and Andrea Bocelli at the Arena in Verona, Italy. He made his professional operatic debut in 2014 in Verdi’s “Rigoletto” at the Opera Națională Bucureşti. Daisy Hulbert made her West End debut in the corps de ballet in “The Phantom of the Opera”. Previously as a company member of the National Moravian-Silesian Ballet in the Czech Republic she performed in “The Nutcracker”, “Swan Lake” and “Snow White”. Lara Martins has appeared in many operas around the world. Her credits include ‘Queen of the Night’ in “The Magic Flute”, ‘Susanna’ in “The Marriage of Figaro” and ‘Despina’ in “Cosi fan Tutte”. Jacinta Mulcahy’s previous theatre credits include playing ‘Baroness’ in the national tour of Andrew Lloyd Webber’s and David Ian’s production of “The Sound of Music”. Her other theatre credits include ‘Cosette’ in “Les Misérables” in the West End. “THE PHANTOM OF THE OPERA” became the longest-running show in Broadway history on 9 January 2006 when it celebrated its 7,486th performance, surpassing the previous record holder “Cats”. This coincided with the Broadway company and the US national touring company celebrating an unprecedented 20,000 performances in the United States. On 26th January 2013, the Broadway production celebrated an amazing 25 years on Broadway. In October 2011 the London production celebrated its 25th Anniversary with a spectacular staging of “The Phantom of the Opera at the Royal Albert Hall” which was screened live in cinemas all over the world and subsequently released on DVD and in August 2015 the show celebrated 12,000 performances in the West End. On 9 October 2016 the London production celebrated 30 years in the West End with a very special charity gala performance in aid of The Music in Secondary Schools Trust. To celebrate this milestone, the current stellar cast were joined onstage by members of the original company and special guests for a spectacular finale. Footage from the evening including red carpet arrivals, interviews and the finale itself was streamed live on Facebook, gaining over 1 million views and reaching a global audience of 5 million people. “THE PHANTOM OF THE OPERA” has won over 70 major theatre awards, including seven Tony’s on Broadway and three Olivier Awards in the West End. It most recently won the ‘Magic Radio Audience Award’, voted by the public, in the 2016 Laurence Olivier Awards. “THE PHANTOM OF THE OPERA”, which opened at Her Majesty’s Theatre on 9 October 1986 starred Michael Crawford as ‘The Phantom’ and Sarah Brightman as ‘Christine.’ It is produced by Cameron Mackintosh and The Really Useful Theatre Company Limited. “THE PHANTOM OF THE OPERA” became the first stage production to reach worldwide grosses of $6 billion, which it did last summer. Revenues far surpass the world’s highest-grossing film “Avatar” (at $2.8 billion), as well as such other blockbusters as “Titanic”, “The Lord of the Rings”, “Jurassic Park” and “Star Wars”. Worldwide, a staggering 140 million people have seen “THE PHANTOM OF THE OPERA” in 35 countries and 160 cities in 15 languages. “THE PHANTOM OF THE OPERA” is currently showing in London, New York, Budapest, Stockholm and on tour in the US. Age Restrictions: Recommended for ages 10 and over. Under 5s will not be admitted. Parental guidance advised.